FleurDanielle: Tag // Would You Rather? Hello Everyone! Hope you've all had a lovely week so far! It's finally Wednesday meaning...ONLY 2 DAYS TILL THE WEEKEND! Today I thought I would do another tag. I've seen this tag on quite a few beauty blogs and even though the posts were quite a while ago I thought I'd throw my two cents in as well! It's never too late! Basically this post includes a set of questions asking which you would rather choose. I will be saying which one I prefer along with a little explanation as to why I have chose this item. I hope you enjoy reading it. Would you rather lose all of your mascaras, eyeliners, lipsticks, and lip-glosses or lose all of your palettes and eye-shadows? It definitely hasn't taken me long to think of the answer to this question! I have only got one palette and around 2 eye-shadows so my answer to this question would definitely be to lose them. I don't think I could last a day without my Revlon lip butters which if you've read throw my previous posts know how much I adore them. If you are a girl then you know that we all have those days where our lives would be a lot easier if we could just shave off our heads and wear extensions or wigs for the rest of our lives! I know I have those days! However I absolutely love my hair and think I would cry if I had to chop it off! Saying that I don't think I could deal with people pointing out how many split ends I have! This is such a tough one! Extensions are an option I guess! Hmm yeah let's go with the extensions/wig option so yeah I think I'd rather chop it all off! In all honesty none of these colors really suit me! However if I absolutely HAD to choose one or the other I'd go with the coral cheek as some coral blushes are just so beautiful. I recently saw one of my friends with the Revlon Photoready Coral Reef blush and it leaves such a warm glow on her cheeks! Check it out if you haven't already! Oh wow what a tough question! To be honest I'd rather buy clothes! Even though there are still so many beautiful brands of make up out there I have yet to try I just love clothes as well! I'd definitely splurge on a new summer wardrobe as I own way to many wintery clothes so some new shorts and skirts and little sleeveless tops and playsuits definitely would not go a miss. How on earth would you even get a lipstick to the waterline area of your eye? I'd end up painting the white section of my eye! I'd definitely go for the eyeliner as lipstick option purely because I've seen pinks, reds and other great colors that would look great on the lips! Unfortunately us bloggers from the UK do not get the pleasure of shopping at Sephora as it doesn't exist here so for me it would definitely have to be MAC. I only own 2 items from MAC, one of which is the MAC lipstick in Creme Cup shade and I absolutely love it. I have heard good things about Sephora though so if I ever manage to take a trip to the US I wouldn't rule it out. Would you rather use one eye-shadow color or one lip color for the rest of your life? To be honest I currently do wear one eye shadow color all the time, I don't really focus on my eyes that much so definitely wear one eye shadow! I tend to change the lips around a bit all the time. My lip collection consists of nudes to me stepping out of my comfort zone recently and purchasing a few bright colors. I couldn't just have one lip color for the rest of my life as half the time it wouldn't really suit my look whereas with eye-shadow I tend to wear one color that can go with nearly everything I wear. Would you rather wear winter clothes in the summer or summer clothes in the winter? Definitely winter clothes in the summer. If you live in the UK then you will know we don't really get a really hot summer. We have occasional days where it can be really hot but then then the rest of the summer months have days where the temperature can really drop down! In the evenings it can get quite chilly too so it is good to have a warm jumper or cardigan to hand! Definitely bright nails all year round. In the winter time it is always dark and dreary and the color of the clothes worn often match this! So I tend to spruce up my hands with either cute jewelry or add color to my nails! It makes all the difference! 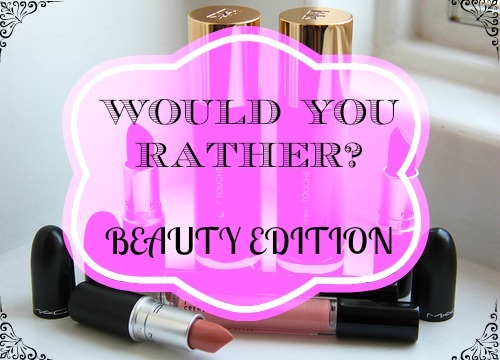 Would you rather give up your favorite eye product or favorite lip product? 100% never paint my nails again. If you read my Nail Polish Collection post then you would know that I have an absolutely disgusting habit of biting my nails a lot. This means that nail polish is sometimes out of the question for me because I just don't have nails to help look pretty. In the last week I have absolutely been loving the Rimmel Apocalips lip-glosses and don't think I will be putting it to one side for a while. Most definitely sharpie them in everyday. I think eyebrows are quite an important facial feature. No offence to anybody out there but I find people with no eyebrows look quite, well, odd. Having no eyebrows would be very weird indeed. Definitely nail polish purely for the reason I bite my nails and therefore do not wear a lot at all. I can go months and months without any color on my nails at all. It's not a big issue for me at all to not wear any! Phew, wow that was a tough tag! Definitely some questions on there that rattled my brain for about 5 minutes at a time however I hope you enjoyed it and as it is a tag I tag everyone who reads this and who has a blog to do it too! Leave a link to your own version of this tag below once you have done it or even better leave your post below if you have already done it. I'd love to see your own answers! If you don't want to do the tag or don't have a blog then just let me know what you thought about this post! Are you a nail biter like me? Do you only wear one eye shadow too?